Prior to booking tickets to Sicily we were hesitating between the western and the eastern part of the island. We would not be able to do everything Sicily has to offer, so better stick with just one side of the island we thought. After a brief (read: shallow) consideration, we bought tickets to Palermo. Delicious, distinctive street food and a bit of history, here we come! So we thought. 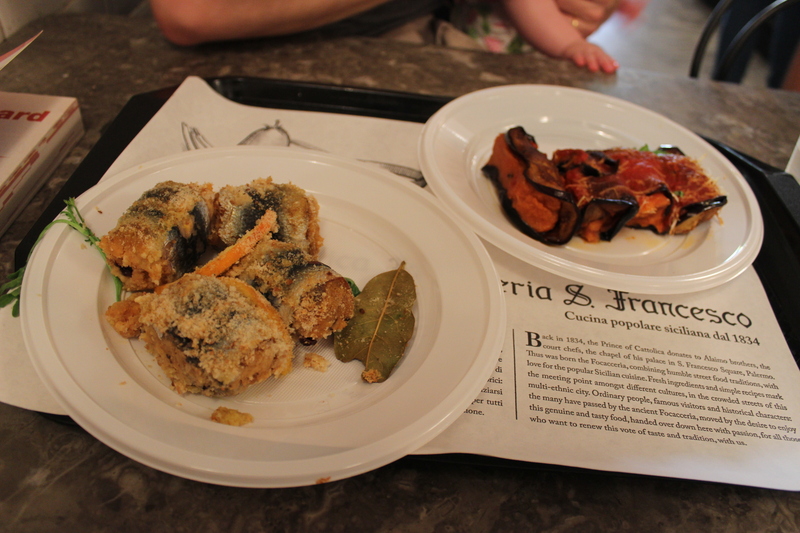 Antica Focacceria San Francesco, a Palermitano institution, is a wonderful place to taste local delicacies. In total, our trip in Sicily was going to last 12 days. We reserved two first nights at Grand Hotel et Des Palmes (a local institution, right in the center of Palermo), assuming that we will definitely want to stay longer. The plan was to eventually continue by a rental car from Palermo to one or two other destinations, preferably by the sea. 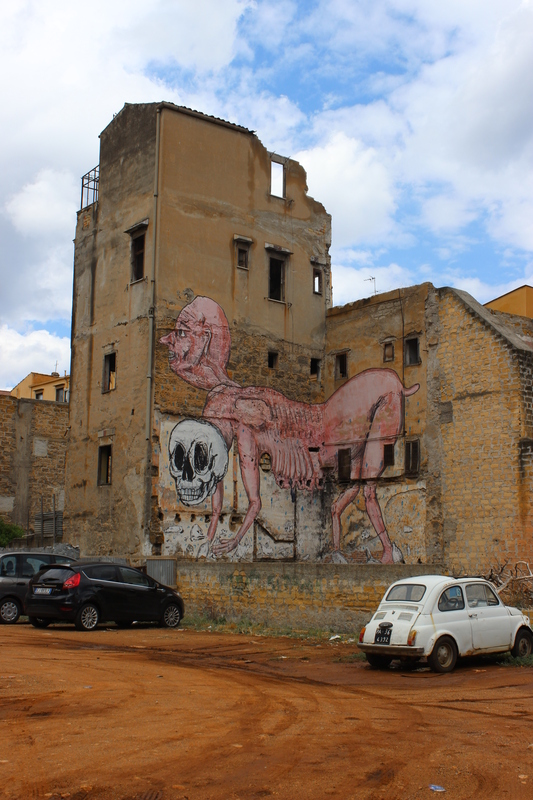 After we had seen “everything” in Palermo…..
Palermo, the capital of Sicily, is full of history and art. Be prepared for a lot of walking! One week later (am writing this from San Vito Lo Capo) I am sorry to acknowledge that our two-night stay in Palermo was more than enough. We are very happy that we hadn’t reserved more nights. 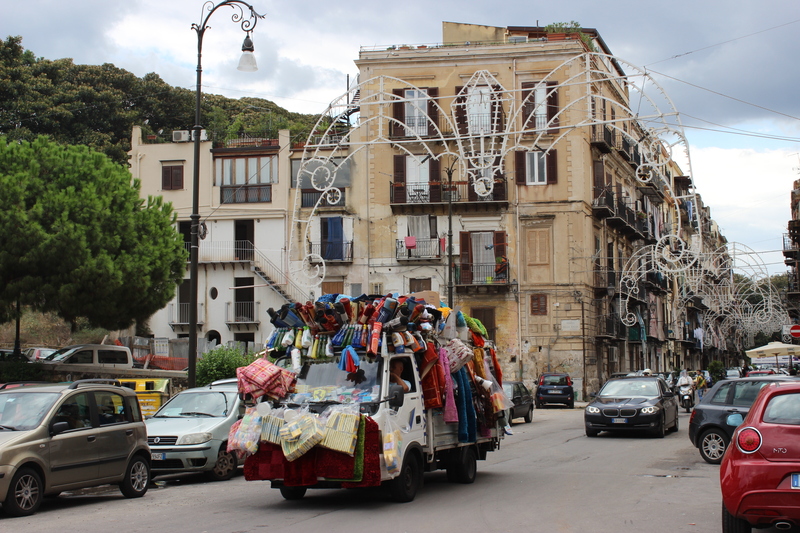 In fact we could not wait to leave Palermo behind us. Why? 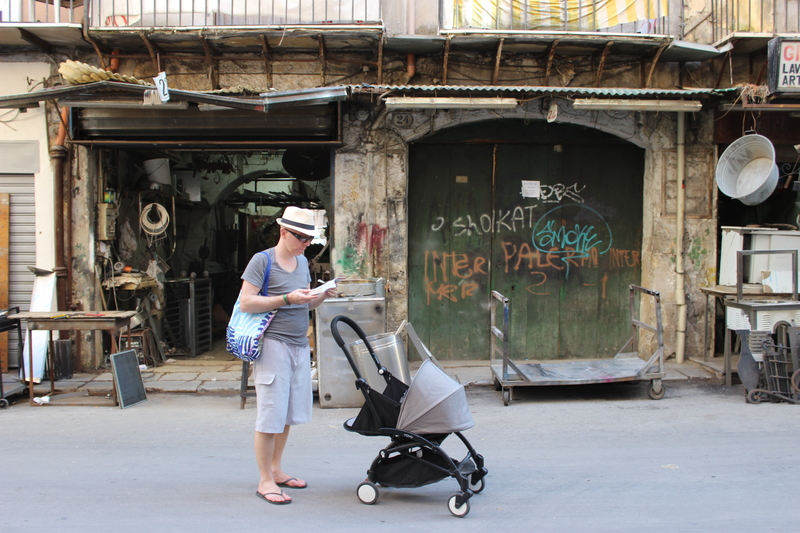 Do not get me wrong, Palermo surely offers a zillion things to do and see, but it was not the right choice for us traveling with a five month old baby. Below is a list of my/our impressions! Palermo is much bigger (and chaotic) than I expected. The greater Palermo has over one million inhabitants, making it the fifth most populated city (with its surroundings) in Italy. My fault, didn’t do my research well enough. I expected more small streets leading to cute piazzas, but streets we saw were big, noisy and very polluted. The potential of the seaside in Palermo is not used as it could be argues the urban architect in me. 2. In order to really understand and enjoy Palermo one needs to visit museums, churches, historical monuments etc., but how many museums do parents with a (crying) small baby usually visit…? Trying to get a feel of this fascinatingly multicultural city just by looking at the walls didn’t make us much more knowledgeable about Palermo’s rich past. See the names? 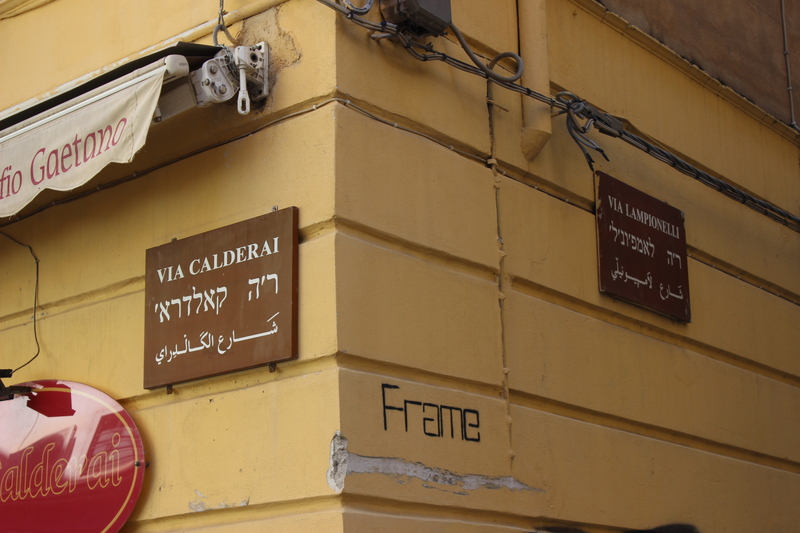 Signs like this show the rich and complex history of Palermo. 3. Our hotel choice was a big mistake. More about that later, but we should have searched outside the city, for example in Mondello, a nearby beach town, and just do day trips to Palermo. This said, our stay in Palermo was not a great success. I am still beating myself up while asking “what did you think of bringing a small baby (with precious lungs) into a big city like Palermo?”. One week later I am still wondering how much of this feeling comes from the fact that we are very tired (accumulation of months’ fatigue…) and how much of it really is because of Palermo. Would I have liked Palermo more should I have gone there before the baby? Who knows. I think someone once called Palermo a rough diamond and I could not agree more. Just that when traveling with a baby one normally looks for smooth and not rough places (lol). This entry was posted in Uncategorized and tagged architecture, art, baby, food, hotel, Italy, restaurant, Sicily, travel on September 16, 2015 by Miia. True that, your pictures make it beautiful! Sorry to hear that you did not enjoy it. I thought it a wonderful place and I would love to return there one day! So much to see and taste!! But I guess it’s not an ideal destination for a baby. Since I don’t have one, my experience is probably very different. We left Palermo frustrated and I hate the feeling but I am sure we will return in some years’ time. And we do have the eastern part of the island to do too! I think it is just part of the learning of what works at the different stages of life. Sorry this was a bit of hard learning. Yeah maybe…. We got home tonight and am actually still trying to analyze what happened. This was the 3rd trip three of us took together, and two others went really well. I still don’t get it! I understand that we have to accommodate ourselves to new ways of traveling, but also, I do think that I had idealized Sicily a bit, and some of the places we went to did not meet our expectations. We have been to Italy several times but never to Sicily. I hope this trip doesn’t discourage you in your travels as a family. No, it doesn’t, but I do regret that I didn’t think longer about the destination (something I have to do when planning our next trip! A lesson learned 🙂 ). There is “too much” to see in Sicily and yet I think we did quite a bit (considering our situation = the baby), I consider we saw next to nothing. Did you travel a lot / as much when your kids were babies/toddlers? Miia we traveled very little when our children were younger other than by car. In all honesty at the time we couldn’t afford it. We have had fun taking them on a fair amount of trips as they got older but very few in the early years.